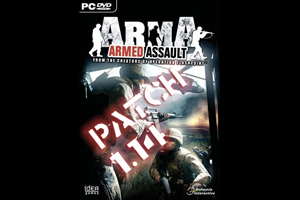 The new Armed Assault 1.14 Update Patch is out! The new patch improves game performance and stability, plus includes a new Multiplayer Mode "Warfare". ArmA Warfare is a blend of a team-based multiplayer mission and realtime strategy included as a free update in the latest patch for ArmA Armed Assault / ArmA Combat Operations / ArmA Gold Edition. Take on dozens of other players on an online battlefield with hundreds of units. Build bases, perform missions, buy equipment and wipe the enemy off the map. Discover a new layout of South Sahrani with far more strategic options. Be a grunt, lead a tank platoon, fly Close Air Support, or command the entire force. Build up your combat force with all new USMC infantry, base facilities and defenses. Two sides fight for control of the entire 400 sq km map in titanic battles over air land and sea. Players must capture whole cities to gain resources that can be channelled into manufacturing even more weapons of war. Each side has one commander, who can build factories and defensive structures in and around their base. As long as they have enough money and resources, players can use these factories to build units, weapons and vehicles. Defensive structures can be used to defend bases and the units stationed there. Players must take account of logistical considerations outside their bases and cities too as truck convoys ferrying supplies between settlements are vulnerable to attack. Players on each side are divided into a maximum of 16 teams. The commander can give these teams side missions and specify tasks or objectives, coordinating the entire side to ensure victory. This is war on a unprecedented scale, even for ARMA! i dont get any volume on my game no matter what i do. will the patch help? have you tried disabling eax bro?